Assistant Teacher- Passed Intermediate Exam with minimum 50% Marks and DElEd/BElEd Diploma or Passed Graduation with B.Ed Degree and Qualified TET Exam for 1st to 5th Standard. Teacher- Passed Graduation with minimum 50% Marks and DElEd/BElEd/B.Ed and Qualified TET Exam for 6st to 8th Standard. Assistant Teacher Science Lab- Passed Higher Secondary Exam with Biology/Maths Subject. Lecturer- Passed Post Graduation Degree in Concerned Subject with B.Ed Degree. 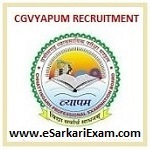 Eligible Candidates can Submit CG School Education Department Lecturer, Teacher 2019 Exam Online Application at the Official Website of CG Vyapam. Applicants First Open CG Vyapam Official Website. Click on CG School Education Department Lecturer, Teacher, Asst Teacher Advertisement Link. Open and Read Advertisement and Check Eligibility Criteria. Click on Online Application Form School Education Department Lecturer, Teacher 2019 Link. Fill Up Registration Form and Pay Application Fee. Upload Photo, Sign and Required Documents. Fill Complete Details and Submit Final Application Form. Take Printout of Application Form for Future Reference.